On Saturday, January 13th, in Bogota, two men questioned human rights defender Blanca Nubia Diaz, according to a statement by Movice. The men called her “snitch guerrilla in a political campaign”, kidnapped, sedated, and threatened her and in a clear act of gender-based violence cut her hair2. On Thursday January 25th, in the district of la Guaripa in the department of Sucre the land claimant brothers Humberto Manuel Escobar Mercado, Prisciliano Manuel Mercado García and Manuel Eusebio Osorio Escobar were assassinated while attempting to demarcate the limits of their farm “La Concepción”3. On Friday January 26th, in the city of Quibdó, Eleazar Tequía Vitucay, an indigenous leader, and coordinator of the indigenous guard of the Embera Katío el Dieciocho reserve, was assassinated by members of the national army4. According to the public statement from the National Indigenous Organization of Colombia (ONIC), the homicide occurred following a communal education initiative that demanded rights to education for the boys, girls and adolescents of the reserve. That same day, on January 27th, in the evening the leader María Cecilia Lozano, survivor of the Mapiripán massacre, Coordinator of the Women’s Network of Displacement Victims in Meta, member of the Departmental Victims Round Table, which is working on land restitution, collective return and the rights of victims organised under the Association of Displaced Women in Meta (Asomudem), was robbed of her belongings and attacked with a knife by a man on a motorcycle. On Monday January 30th, according to information shared by the human rights defenders’ organisation Credhos7 in Cantagallo, South Bolivar, the communal leader and human rights defender Nixon Mutis was found dead. On Monday January 30th, in the municipality of San Calixto, North Santander, Leidy Amaya, who was working has health promoter, was assassinated8. 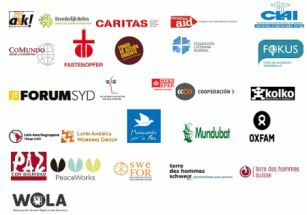 These new incidents can be added to a long and painful list of assassination, threats, information theft9 and disappearances of social leaders.10 They are despairing messages for victims of the armed conflict in Colombia, who are currently promoting peacebuilding in the territories. In addition to the situation faced by social leaders, we as international organisations committed to peace in Colombia, also wish to draw attention to the assassinations of members of the FARC, which according to the report from the United Nations Verification Mission in Colombia, rose to 34 in December of 2017. The assassination of a further 13 relatives of members of the FARC should be added to this number11. In January 2018, an additional four members were assassinated, including one minor12. Protecting the lives of ex-combatants is one of the Government’s main commitments according to the peace agreement. We urge the Colombian government, in its role as human rights guarantor, to put in place the means to protect the lives and work of social leaders, to adopt all necessary measures to ensure that such crimes do not reoccur and to effectively investigate the material and intellectual authors of these crimes and to punish them to the full extent of the law. We call on the accredited diplomatic bodies in Colombia and the international community to condemn these acts and to monitor the judicial processes so that these crimes are not left unpunished. ← Letter to the Inter-American Court of Human Rights about the Peace Community of San José de Apartadó.